Any experienced shooter knows that practice is essential, even more so if you decide to carry a pistol for protection. 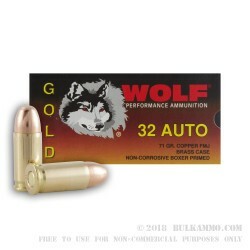 This .32 ACP ammo by Wolf Gold is the perfect range ammo for your CCW. 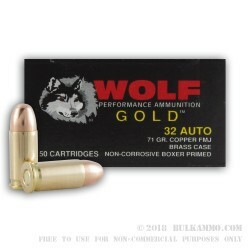 These Wolf Gold cartridges are assembled using new brass casings, Boxer-primers, and 71gr full metal jacket (FMJ) projectiles. This ammo is non-corrosive, and the casings are reloadable. 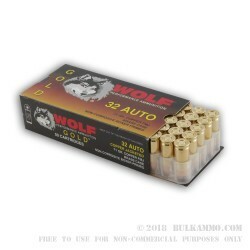 Wolf ammunition is manufactured all over the world, but their Gold pistol ammunition line is currently produced in Serbia. This 50-round box is a great value and will afford you plenty of range time that won't break your budget. Order today!